Design your Own Custom Nursery Bedding! Royal Bambino offers custom made nursery bedding. Design your own creation with a variety of fabrics and styles to create a one of a kind custom bedding set! We offer a variety of options for you to design your nursery bedding. We are available through email at customersupport@royalbambino.com or you may call us at 877 506 1262 for a consultation to discuss the endless possibilities. We can create baby bumpers, coverlets, crib sheets, dust ruffles and accesories such as valances, curtains, diaper stackers, pillows and many more accesories. We can use our own fabric from hundreds of choices to choose from or you can provide us with your own fabric! Visit us for endless possibilities on baby bedding and baby bedding accesories. Nothing is comparable to the joy of expectant parents for their coming baby. To Moms, they take pride in finding great baby things for their babies. 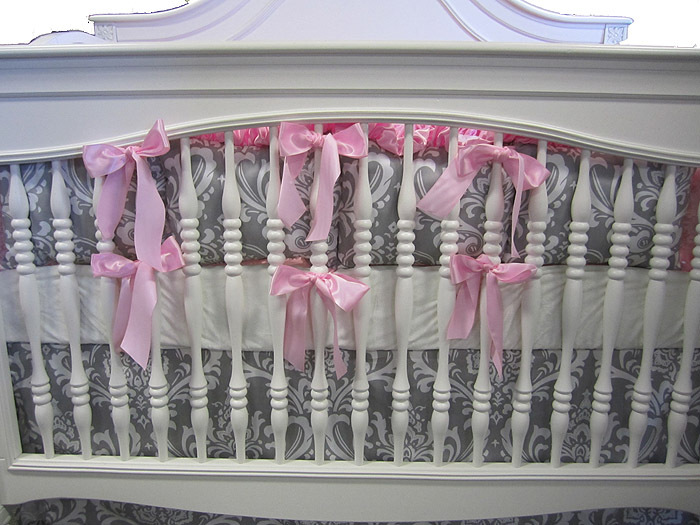 For a baby girl, most Moms prefer furls, laces, and designer nursery bedding for girls. What is good about baby bedding is that they come in playful designs of colors and styles to capture the taste of fussy mothers. You can choose from classic to modern style inspired in heavenly pink collections. Uniquely designed for baby girls, mothers can have a perfect buy for her baby girl bedding collections. Nursery Bedding For Girls is an exciting hunt for fabulous colors and elegant nursery bedding collections. However, mothers are not forgetting the essentials of baby comfort and safety as well. Styles and choice of fabric must come along together. Crib bedding that is exposed to baby’s skin must be comfortably soft, smooth, and warm to the baby’s skin. These are the things that a baby-bedding manufacturer should have in mind when designing things for nursery bedding and accessories. Anything that is less than these requirements will not capture the meticulous taste of mothers regardless of its unique and fashionable creations. Nursery Bedding for Girls usually include stacker diaper, pillows, bumpers, and comforters. Likewise, bedding designs may vary from rainbow colors and pastel floral designs. For a more appealing approach, other baby accessories are available to match the colors and designs of your nursery room. You can never run out of beautiful ideas when it comes to baby needs and accessories. Most mothers wanted to create their own style and design, and preferred to have customized crib bedding in a more personalized approach to suit their artistic taste and fashion. Normally, a nursery room is located in the most quite place in the home to provide maximum comfort to the baby. Babies are expected to stay for long hours in the nursery room. For this reason, babies need to have a warm and soothing environment while they sleep in the nursery room. To achieve this level of comfort, both mother and child should be relaxed and refreshed all the time, free from worries and unnecessary disturbance. Choose your nursery bedding meticulously. Be sure, to choose the right materials for your baby’s needs that are exposed to her skin. Bought the crib you wanted and looking for the bedding that would go perfectly with it? This article will guide you on how to make that decision. The crib will almost inevitable be the spot light fixture in your child’s nursery. Thus look for bedding which highlights what makes it special. If the crib is antique with delicate carvings do not pick out bedding, which is too bulky or overly frilly as to compete with it. If the crib itself is plain, the crib bedding should be the star then. If you already have a theme for the nursery the bedding can complement that and pull the whole look together. The colours that you choose for your bedding should not only be in harmony with the rest of the nursery but should also be soothing, calming colours and not jarring for the baby. You could also approach it the other way around. Instead of matching the bedding to the nursery, why not pick out the bedding first and then plan the nursery around that. This will not only help you enhance that focal point more but also you will have acquired the most important utility for your baby’s comfort with time to spare. While looking for bedding you could scour baby shops or even online looking for the perfect bedding or you could have it custom made. Though a bit expensive, those willing to fork out the money will certainly be satisfied with the amount of input they get into the planning. It is also relatively less stressful than making the rounds of different shops as not only you get the bedding as per your satisfaction, but once the planning is done you can kick up your feet and just wait for the bedding to be delivered. If you’re looking for any kind of bedding for your baby, visit the Royal Bambino website (http://www.royalbambino.com/) where you will surely find the bedding of you dream. Though style is important the factor that parents should concentrate on most is the safety of their baby. Don’t surround your child with loose sheets or fabric in the earlier months as this can cause them to smother or choke. While picking out crib bedding it is also important to pay attention to the material and buying as close to 100% cotton as possible is your best bet as synthetic material can be irritable to your child’s skin and cause them discomfort. Shopping for the baby is always fun. Hope this guide helps. Happy shopping! For new Moms, nursery gliders or baby rockers are considered important furniture in nursery rooms. Baby gliders come in different styles and designs. However, their main function of baby gliding chairs is to provide a wonderful and soothing experience while in slow oscillating motions. This can be done while the carries the weight of both mother and baby. Mothers are relieved from carrying extra weight for long hours and can hug the babies while seated in baby gliding chairs. For durability and strength, baby gliders are made of solid wood base with hinges and bearings to create that perfect gliding motions. To give a more sophisticated look, baby gliders are fully upholstered with detachable cushions for easy cleaning and washing in case of milk spills. Some Mommies are confused whether to use nursery gliders or use the traditional baby rockers. Normally, your choice will depend on your preference. For this reason, Mommies should discover the good points of baby gliding chairs before they pick their choice. Normally, nursery gliders are provided with wide and long backrests with ergonomic arm height for ease in arm positioning while feeding the baby. In addition, some designs come with ottoman for additional comfort where mother can rest their feet when the nursery gliders are steady. 1. Nursery gliders are the earlier and modified version of rocking chairs. Though they are built with the same purpose, these gliding chairs are built differently. Rocking chairs are usually made of solid wood with no hinges and bearings while baby gliders have hinges, bearings and suspension device. 2. It is accident free. You can trust your children from playing around nursery gliders. The gliding motion from side to side prevents accidental pinching of children’s arms or feet that is normally experienced with rocking chairs. 3. The traditional rocking chairs primarily are made of wood that may come with or without cushion. However, baby gliding chairs are fully cushioned and detachable for easy cleaning and washing. 4. Gliding chairs are sturdier because its legs lie flat on the floor to give a horizontal gliding motion while rocking chairs are usually arched to give a jerky upward and downward movements. With the latest innovations in nursery gliders, baby parenting has been made easy and fun for the entire family. With baby gliding chairs, you only do not spend great times with babies, but you also give the mothers the luxury of time to spend with her baby in a more comfortable and convenient manner. Without baby gliding chairs, it would be tiresome on the part of the mother to carry the baby all day nursing and cooing at the same time. For expecting parents, you should include nursery gliders in your priority list. This is an investment for the entire family where you will gain contentment, love, and affection for the rest of your life.